Looking for very affordable flights? Then send us a review of your Skywise flight to cheapflights@southafrica.to and we'll send you some unique SouthAfrica.TO travel vouchers. 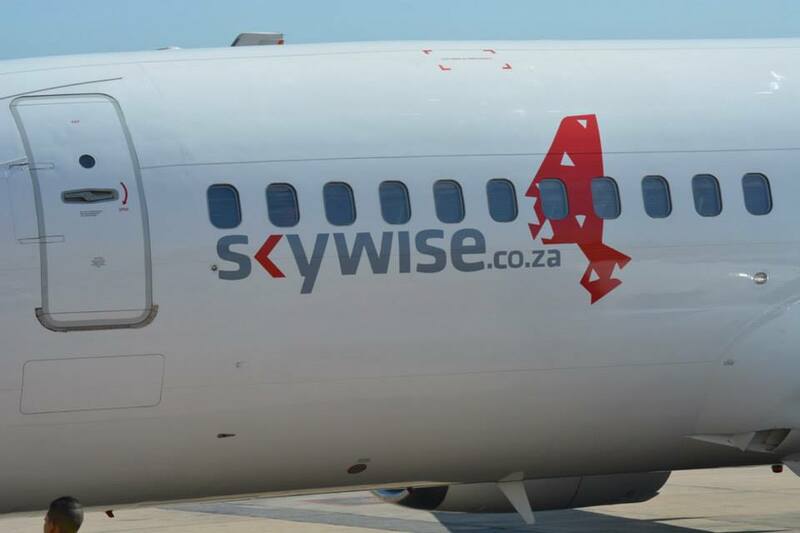 Skywise offered affordable flights between Cape Town and Johannesburg. Currently the airline is not operational. The airline started selling tickets on the 11th of February 2015 and their first scheduled flight took off on the 5th of March 2015. On the 16th of December 2015 they announced the suspension of all further flights. 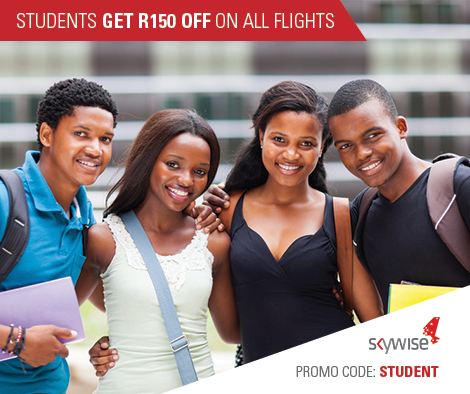 26 October 2015 - Skywise is running a student special on all flights until the 30th of November 2015 in support of the #FeesMustFall movement. You can make use of the promocode "STUDENT" to qualify for a R150 discount on their website. Skywise's terms and conditions apply. 9 September 2015 - For only R7999* per month, you can sign up for unlimited Skywise flights! The subscription will be valid for a full 30 days, regardless of when you sign up during the month (could be 15th of April until the 15th of May for example). Flights are only for one person during the subscription month and is not transferrable. Upon purchase you will be contacted by a personal agent who will endeavour to book all your flights. If they can't secure your preferred flight at least 48 hours ahead of time, they will add a day to your membership period. For more details and terms and conditions, head to Skywise's website. 27 May 2015 : We are running an Exclusive Skywise offer for flights between Johannesburg and Cape Town. We are selling one way flights at R675* on the 27th, 28th and 29th of May 2015 only. The travel period for this sale is 27 May to 31 July 2015. The offer can only be booked through out call centre. Please call us at 087-351-2051to make your booking. Clients can book until 5pm on the 29th of May 2015, or when availability runs out. The R675* is all inclusive and includes taxes. Since FlySafair is running with R498* flights on the CPT-JNB routes, Skywise had to come in a little lower, and they have. The airline has launched flights between JNB and CPT with airfares starting at R498*. The airline also includes checked luggage which gives them the upper hand over FlySafair who charge passengers for checked luggage (subject to change, limited availability). 16-02-2015: New LLC Skywise has decided to move the launch of their JNB-CPT flights forward to the 5th from the 26th of March 2015. The airline said that they have been experiencing higher than expected demand. They have decided to move the launch date forward because of the high demand for flights from the public. 11-02-2015: Skywise has opened ticket sales and boy will you be surprised by their prices. The airline will only be flying between CPT and JNB initially with airfares starting at R498*. The price includes one checked bag which can weigh up to 20kg. They have decided to include checked luggage in the price of their airfares, unlike FlySafair who charge passengers for checked luggage. 22-01-2015: Skywise tickets will go on sale on the 11th of February 2015 and we can't wait to catch a glimpse of the promotional fares that they will hopefully start advertising soon those dates. 4 September 2015. Get 20% off Tuesday flights on the 8th and 15th of September 2015! Simply head to their website to claim your voucher code and enter it. The voucher expires the day before the flight. So if you want to travel on the 15th of September 2015, make sure you book your flight before the 14th. 16 July 2015. 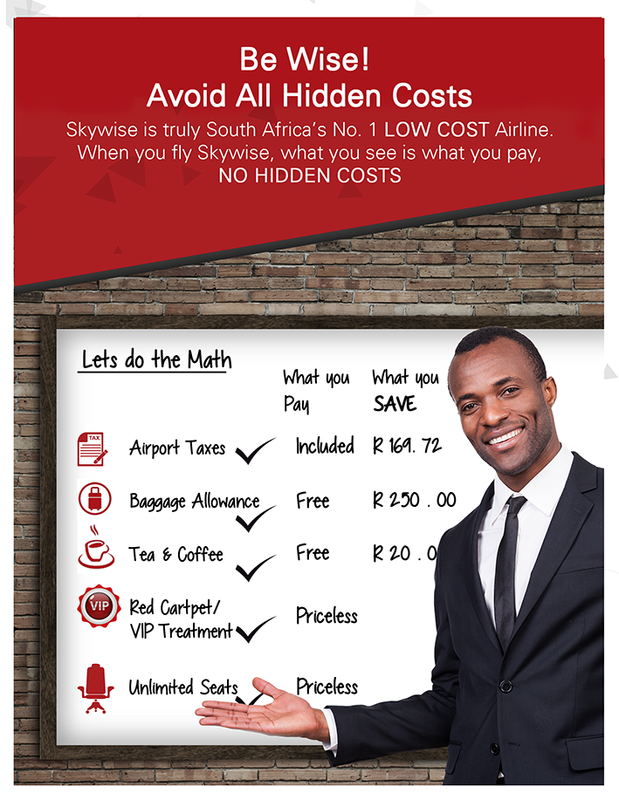 Skywise is celebrating Mandela Day with a great flight special! On the 17th and 18th of July 2015 they will sell 4600 tickets on the Joburg-Cape Town route from only R466,46*! This refers to Nelson Mandela's prison number. You can find more details here. 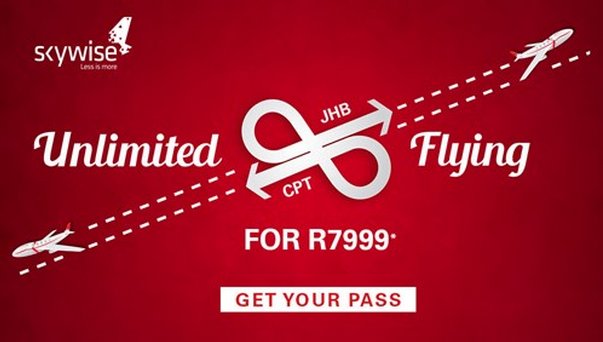 27 Feb 2015 : Skywise is running a special on flights between JNB and CPT. They have released 2000 seats at a price of R450 for a one way flight. Clients can book until 12pm on the 3rd of March, or when availability runs out. The R450 is all inclusive and includes taxes.